If you’ve ridden a Timbersled Mountain Horse kit and you like to hit jumps or drops, you’re all too familiar with the limitations of the stock Fox Zero Pro shock package. Who doesn’t love to jump a snowbike every chance they can? One of the weaknesses of the stock package is, when the rear bottoms out on landings, the force on the rear of the suspension has a tendency to throw the front end of the bike forward and down which can be difficult to control and requires a significant amount of riding effort to counter. Our TRS Spring Packages are designed as replacements for the springs on OEM Fox Zero Pro shocks but with significant performance improvements! Our TRS Snowbike Springs are 1/2″ longer than the Fox ones they were designed to replace. The initial rate is softer and gives the first 2″ of bike travel the nice plush feel to start. As the springs enter into the bottom end of the shock stroke, we transition to an increased spring rate to reduce the bottom out effect. With the addition of the rail mounted bump stops on the 2016 Mountain Horse kits, Timbersled has worked to improve some of the ride quality. The Raptor TRS Snowbike Spring package is a very effective spring package for the 2016 and ALL earlier kits! The one piece TRS springs are coiled as one continuous piece in our bowling pin styled design. 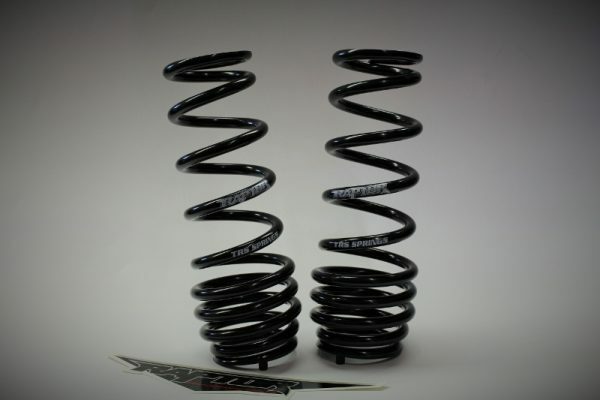 This design is engineered to reduce weight over other springs on the market and increase stability by better controlling buckling of the spring. Our springs eliminate shock body wear caused by mechanical bind seen in conventional multi spring/collar designs and are also whisper quiet.